I have been working in a particular section of my HomeschoolMath.net site - the section that has free math lessons. It's been needing some updating for a long time... and finally I got around to it. Websites are like most anything else you own - you have to take care of them. Well, they CAN go on their own (like autopilot) for a while but if you never update them, they will eventually lose traffic and go downhill. I still have lots of work to do... (and I'll do my best to keep cleaning and improving the pages in this section) but here are some updated multiplication and division lessons. They are essentially sample lessons from my books. Enjoy! I've been working on my HomeschoolMath.net site lately, this time adding a section to the page about factorization and factors. The new section lists online games and quizzes for greatest common factor and least common multiple. These are typical topics for sixth grade, and if you happen to need practice problems for them, try out the games & other resources & enjoy! Just a small update on my site... I have had a basic operations worksheets generator there for years, but I realized lately that maybe not everyone knows that you can make with it addition, subtraction worksheets, multiplication, and division worksheets. So, I created two new pages, one concentrating on multiplication worksheets and the other on division worksheets. Now, those who search for such can easily find them. Both pages are for grades 3-5, meaning they have sections for each of those grades. 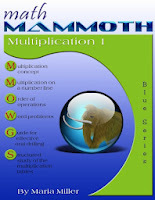 You can get certain Math Mammoth bundle products at 40% off at Educents.com. This deal ONLY lasts for 10 days - till October 31! I have updated several of the 3rd grade multiplication lessons on my HomeschoolMath.net site. These are essentially the same as in my book Math Mammoth Multiplication 1, so they work as sample lessons for this book. Enjoy! And no, there are no answers available on the site. These are just simple lessons and problems (grade 3). To get the answer key, you need to get the book, which has many more lessons and contains a complete, structured system for learning the multiplication tables. I know some of my readers are teachers, and are looking for materials aligned to the Common Core. For them, I have made a simple page on my site that lists the materials I offer that are aligned or follow the Common Core. These include the complete curriculum, free worksheets, and short topical units at my TPT store and Teachers Notebook store.